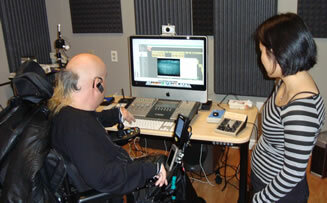 Vancouver Adapted Music Society (VAMS) unveiled the country’s most modern studio for musicians with disabilities on Thursday, 27 November 2008. The VAMS studio was launched at an open house which featured musicians working in the studio, to demonstrate the technology and provide interviews. Built at Vancouver’s GF Strong Rehabilitation Centre, the studio is designed for people with a wide range of disabilities and musical capabilities. Studio experience and the nature of an individual’s disability will not be barriers — someone paralyzed from the neck down can find ways to create and record great music. Participants can play instruments live, record themselves singing/playing, program computer synthesizers, put together multi-track recordings, and burn their completed work on CD — in 24-bit, 96 kHz DVD-quality audio. According to Vancouver music scene veteran Bobbi Style, of Coquitlam, the studio “looks really good and sounds really good. It’s excellent. It’s industry standard.” Having been a pop star in England in the 1980s, and subsequently an in-demand Vancouver-based producer and mixer (he also writes music), Style has worked in studios across Europe and North America. Having cerebral palsy and using a power wheelchair, he knows just how frustrating it can be to work in a regular, non-accessible studio. Bobbi Style and Sheila Lee. 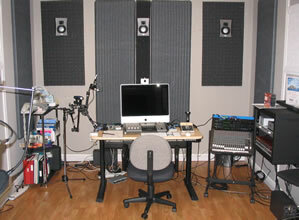 The studio uses industry standard recording equipment, including a Macintosh computer running Logic Pro (music interface), Apogee Ensemble (audio interface) and Euphonix (digital audio mixing console). 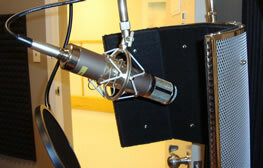 It also has equipment designed for people with significant disabilities, which won’t be found in the average recording studio, including: Magic Flute (a synthesizer mouthpiece controlled by tilting), Midi Wing (computer-based controller that allows note-by-note composition), Head mouse (head-operated mouse for people with limited hand control) and a sip ‘n’ puff jouse (mouth-operated joystick). The VAMS studio, equipped with Macintosh. VAMS was co-founded by Sam Sullivan and Dave Symington, both quadriplegics, in 1988 to support and promote musicians with disabilities in the Greater Vancouver area. VAMS works with newcomers to music as well as highly talented musicians, while providing facilities to enable people with disabilities to take their music to another level by improving their composition and playing skills. Programs range from karaoke to workshops in a fully equipped music studio. VAMS has introduced hundreds of adults and children with disabilities to opportunities that provide an outlet for creativity and self-expression. Vancouver Adapted Music Society has produced a showcase CD to highlight the talents of its members. The CD features some very talented performers and demonstrates convincingly that disability is no barrier to musicianship. Our hope is that it will inspire others with significant physical disabilities to pursue their passions and search for ways to realize their dreams. More info about the CD is available on the VAMS website. Magic Flute: a mouthpiece with a built-in gyroscope. The player tips the device, which is held on a stand, to determine what note to play, controlling the volume and pitch through their breath. Midi Wing: a computer-based controller that allows the performer to select notes and rhythms via switches and a controller — which can be a slider, knob or joystick. Head mouse: which replaces the standard computer mouse for people that have limited use of their hands — in this case, to access music-making software. This features a wireless optical sensor, placed on the user’s head, that drives a computer pointer. Sip ‘n’ puff jouse devices: essentially a mouth-operated joystick/mouse, driving the computer equipment. In addition, the Tetra Society of North America (a sister society to VAMS which recruits volunteer engineers to create custom adaptive devices for people with disabilities) is making a keyboard stand. Listen to the interview from the original broadcast. Village 900 AM, Global Roots Radio, Camosun College, Victoria BC, Canada. 2 December 2008. Interview recorded via phone. sylvi macCormac received an honourable mention at the International Musique Electroacoustique Bourges, France (1999) and produced Uts’am / Witness CD (2004) including Buffy Sainte-Marie, Bruce Cockburn, Barry Truax and Squamish Sp’ak’wus Slúlum / Eagle Song Dancers. A multi-talented performer/composer of modern music, and the creator of WHEELS: Soundscapes with the voices of people with dis abilities, sylvi macCormac has extensive performance credits since the 1980s, including the Vancouver Folk Music Festival, New Music West, and Seattle’s RockrGrl Music Conference in 2000. Electroacoustics, including Soundscape Composition, stretches the boundaries of music by collaging sound, story and song, transforming sound sources with signal processing and combining them in creative ways. Diffusion extends familiar structures, by placing the listener inside the Soundscape while inviting us on imaginary journeys. [Kevin Rapanos] In Vancouver’s GF Strong Rehabilitation Centre, the Vancouver Adapted Music Society has worked to build a state of the Art recording studio fully accessible to people with Dis Abilities. 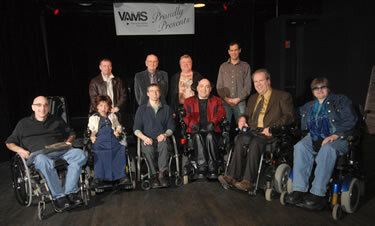 VAMS was co-founded in 1988 by two Vancouver Musicians, Sam Sullivan and Dave Symington, both Quadriplegics. Sam, who played the keyboards, and Dave, a drummer, formed the Society to tackle the barriers faced by musicians such as themselves. Both had become Quadriplegics due to Sporting Injuries. 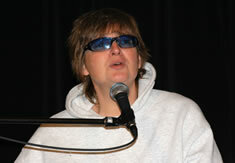 i caught up with sylvi macCormac, one of Vancouver Adapted Music Society’s featured artists. Sylvi has Multiple Sclerosis but has none the less had a long and successful music career, partly in thanks to VAMS. 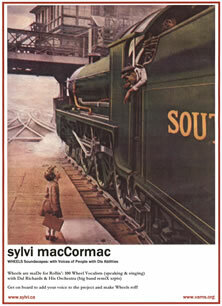 [sylvi macCormac] Now that the Studio is State of the Art, and when i say that i mean State of the HeArt. There’s a lot of heart and soul has gone into building it, because it’s allowing a place for Musicians with Dis Abilities to work to the best of our Ability, with a supportive community. It’s not really designed for Music Therapy, but as we know Music is Therapeutic, and it’s Spiritual and it’s Communication. it’s set in GF Strong, which is a Major Rehab Hospital. so it’s unique and overwhelming because for myself with MS, i learnt in the first week being at GF Strong, that it is Neuro Musculo Skeletal Dis Ease. So it’s overwhelming, but it’s wonderful because of the support of community. We listen to an excerpt of Horizon. [SM] if we look beyond the confines of the performing stage, and we can look further, Music is bigger than we are. Success does not always have to be in financial terms. It can be in Creativity. like Glenn Gould suffered his own dis abilities. He was a great piano player but he was also a perfectionist. He found that by going into the Recording Studio it allowed him to excel at that. Alyssa Serpa, a guitarist that i was playing with recently was speaking about being interested in Geology. Barry Truax at SFU has some of the most beautiful music, and he is a computer whiz as well. Music goes beyond just performing on stage. By learning all of those things to co-produce Uts’am / Witness CD, which included Buffy Ste-Marie, Bruce Cockburn, Barry Truax and Squamish Eagle Song Dancers, i was so honoured and excited. and how could i have done that except that even the Dis Ability forced me to go to school to study Music Education. So, it opened up a wonderful field. Music itself, it’s so expansive, bigger than us. [SM] VAMS allows a creative space for musicians to have accessability, and the studio allows for infinite possibilities for recording and communication. VAMS furthers the goals of helping people with dis abilities and all people, as we become a more inclusive and compassionate society. to me, Dis Ability and Ability are fluctuating, shifting like water. they are malleable, constantly changing. and it’s our perceptions and definitions of what it is to be human and frail, and our strengths, right ? So, we are often underestimated as people with Dis Abilities, and as people. And a healthy society, i think, includes a diversity of people, and a vibrant cultural mosaic of all peoples. So it’s really important. VAMS is really important for all people. Members of the Vancouver Adapted Music Society.